Our killing frost finished off the rest of the vegetable plants in my garden. The only ones left were the cold-tolerant types like Brussels sprouts, kale, turnips and a few others. I thought that I could coast along until it was time to harvest those crops later next month. Earlier this week, I went out to the garden to check my Brussels sprouts. I was surprised to find the sprouts covered with aphids and the leaves infested with active cabbage worms. Apparently, our warm Indian summer stimulated a population explosion of insects. I put away the sprayer for the season a couple of weeks ago. So, I dragged it back out and filled it with a solution of Pyola insecticide. This is a very safe and effective spray for most garden insects. It is basically canola oil combined with a small amount of pyrethrum and is approved for use in organic gardens. After thoroughly drenching my Brussels sprouts, I triple-rinsed the sprayer, dried it out and put it back into storage. Hopefully, that will be the last time it will see the light of day until next spring. 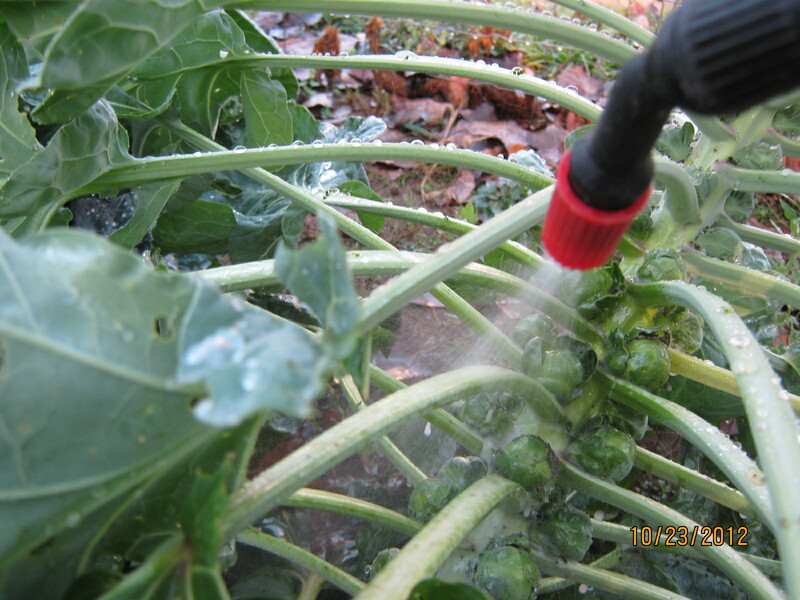 A spray of organic insecticide will take care of the insects on these Brussels sprouts. Someone mentioned to me today that they had traveled to Northern Michigan last weekend to see the fall colors. He said they were the best he had ever seen in his life. That’s a pretty big statement coming from someone who is over 70 years old. I’ll have to take his word for it because I missed it. Looking at huge vistas of fall colors from the comfort of your car is a lot of fun. Sometimes you need to get out of the car and appreciate the small color displays up close. In a spot in our yard that we keep wild, we have three different species of wild asters thriving. There’s the dark purple New England aster growing along side a lighter purple aster and a white species. Driving along at 55 mph you might catch a fleeting glimpse of our native Michigan asters while on your color tour. But to really appreciate them, you need to get out of the car and look at them close up. We had a pretty decent Butternut squash yield this year. I planted them in a new part of the garden, which I’m sure helped boost the yield. Plus, we had very few insects on the squash. As a result, we now have plenty of Butternut that will go into storage straight from the garden – unprocessed. Winter squash store best with the stems left on. 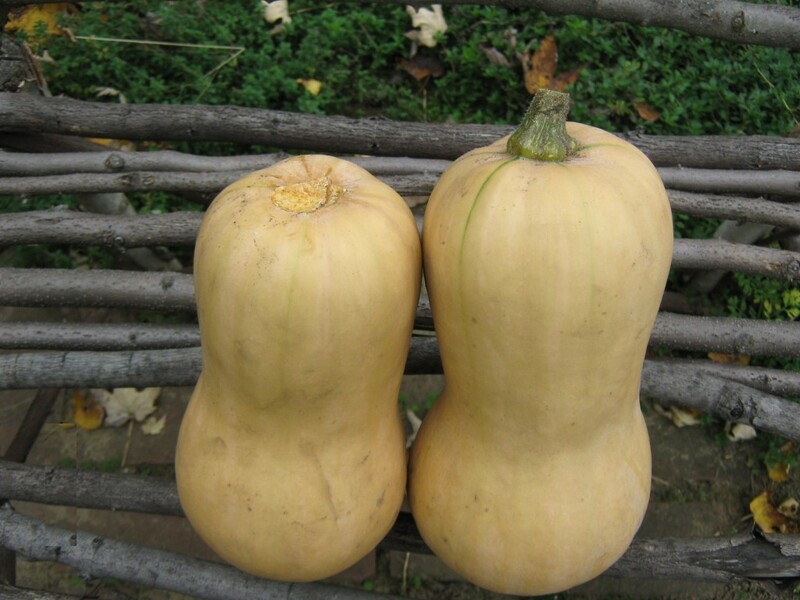 Store your best, unblemished squash in a spot that will stay around 50F and have about 50 percent humidity. You should be able to enjoy your home-grown squash into early 2013.